The votes of the leftwing EFF of Julius Malema helped the ruling centre-left ANC (African National Congress) party to adopt an amendment moving forward the dreaded ‘land expropriation without compensation’ which could mean that many ‘white farmers’ will now lose their farms. Earlier this year, US President Donald Trump was slammed by the mainstream media for daring to stand up for South Africa’s ‘White Farmers’ after a series of articles in rightwing outlets highlighted the plight of people (who have lived and worked on their land for decades) faced with eviction (without compensation). The US President was accused of highlighting a ‘conspiracy theory’ which would ‘never take place’ it was said. Related coverage: <a href="https://thegoldwater.com/news/27560-South-Africa-We-Need-Our-Land-Back-And-We-re-Going-To-Take-It-By-Force"> South Africa - “We Need Our Land Back And We’re Going To Take It By Force”</a>. Four months on, and the South African parliament, faced with an economic recession, several ministers involved in scandal and a major political party (ANC) needing the support of leftwing extremists EFF ((Economic Freedom Fighters, a radical-leftist ANC breakaway that supports expropriation but also seeks state ownership of all land) not to get overrun in the upcoming election, and the dreaded policy is soon to become 100% legal. But opinion is divided on the merits of expropriation without compensation. The ANC endorsed the principle of expropriation without compensation last year to address what is widely seen as the abysmally slow pace of redistribution. South African President Mr Cyril Ramaphosa, who faces pressure from his left-wing insists that “we are not going to allow any land grabs”, and that a constitutional amendment will set out stiff conditions that expropriation must not risk food security, the economy or agriculture. To secure the two-thirds majority required to change the constitution, the ruling party will need to produce a draft acceptable to the EFF, which means that at least some expropriation without compensation of ‘white’ farms will surely be in the making. Socialism results in theft. Racism directs theft at people whom are not the same color. This is just Socialist Racism. Saying they 'got it right this time' and wont cause a disaster is wrong. People whom believe that they will get it right, are insane. Aparthied, ANC, the difference is color and who is in charge, not the racism or injustice. when is Trump going to put sanctions on the S. African savages? Apartheid Works! Well, it used to. 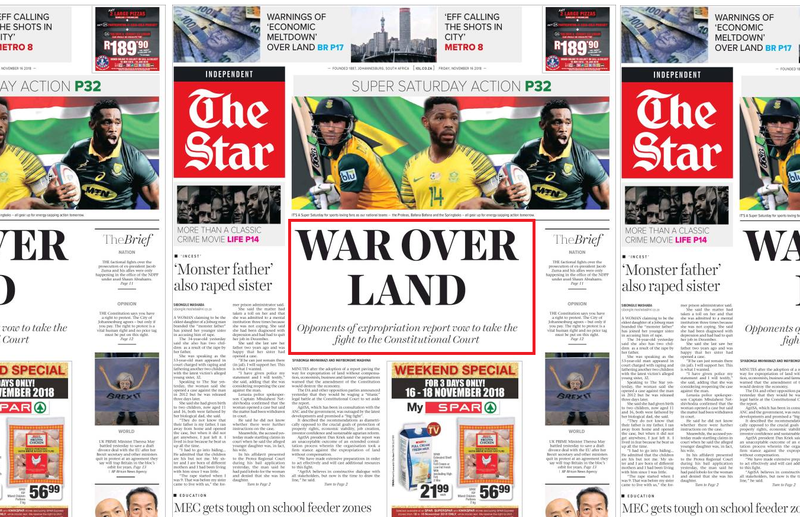 US needs to invade SA and crush ANC turds. THEY DIDNT DISPLACE ANYONE. THEY BOUGHT THE LAND, FAIR AND SQUARE GENERATIONS AGO… IGNORANCE ABOUNDS. DO SOME RESEARCH AD GET EDUCATED B4 SPEWING LIES. IT WONT MATTER ANYWAY, THEY ARE SACTIONING THEMSELVES. THEY WILL ALL STARVE TO DEATH AFTER GETTING RID OF THE FARMERS WHO PROVIDE HUGE % OF THEIR FOOD NATIONWIDE. THEN THEY WILL COME CRYING TO YOU FOR YOUR TAX MONEY TO FEED THEM. AND ITS NOT AMERICA THAT HAS WREAKED HAVOC ITS THE ELITE AND THEIR AGENDA TO RULE A ONE WORLD GOVERNMET. LOOK AROUND THEY ARE DISPLACING EVERYONE FOR THEIR OWN GAIN. YOU CAN SUPPORT THAT IF YOU LIKE. F*** !!! I BET YOU BELIEVE IN FARIES TOO DONT YA?! If only there was a woman who made designer handbags which we could call upon to sort this mess out. To think, all it took to throw out the corrupt british government from American shores was 3 percent. In South Africa it seems as though everyone knows who the bad actors are. Even money says a number of the actors are going to die soon.